Well, as a parent and teacher it is sometimes your role to lead in the dance of development. 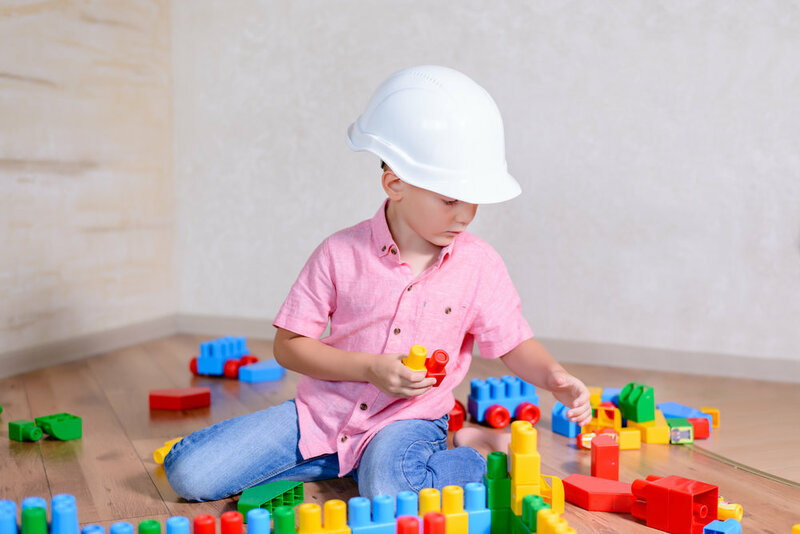 It is up to you to help create a space and pace for your child to experience the joys of learning — learning that allows the higher levels of organization that are important for coordination, balance, and attention to unfold naturally. Taking time to explore with your child will empower both of you for a lifetime. “W-Sitting” or “W-Sit” is referring to the position of a child’s legs when they sit on their bums with their knees bent and their feet out to either side of their hips. I know you have seen this somewhere before. Perhaps you thinking it looks a lot like the vajrasana pose you do in your yoga class. Maybe you did it as a kid or know someone who has. Perhaps you have even seen it in your own munchkin. Children often move into and out of this position during play or when transitioning from crawling to sitting, especially before 11 months. It temporarily widens the base of support, giving the child a greater sense of stability and balance during exploration and play. You may even see your older child coming in and out of this position from time-to-time while playing on the floor. W-sitting is perfectly normal and a brilliant strategy for freeing the arms and hands for play when used in this way. The key is that they have several position to comfortably sit in and can easily transition between them. What if my child is older and only sits the “W” way? First give that child a HUG! Isn’t it fantastic that she was able to find a position that felt safe and allowed her to delve into more complex explorations like reaching for a toy or finger painting. Okay now that you acknowledged her brilliance, let’s see if we can help her discover that same sense of stability and comfort in other positions. Chances are she hasn’t fully integrated the Symmetrical Tonic Neck Reflex (STNR) and is overcompensating. Whew! That was some serious developmental jargon. So let’s see if the following sounds familiar: maybe she wasn’t comfortable on her belly as an infant or skipped the creeping and crawling phase — bunny hops and bum scoots are popular strategies that keep them moving. A lot of people go through life just fine skipping over these developmental phases. Many of them find ways of integrating later on…but some don’t. Below are some of the side effects of having a ‘retained STNR’. Remember, it is a reflex, which is neurological. The reflex impacts action, which in turn influences muscle development, which then makes changing a habit more challenging. So the earlier we integrate the easier it is. But we are human and most of us have an incredible capacity for learning, growing and integrating throughout all the phases of our life. A teacher once told me that climbing is the big-kid version of crawling. You get to play with cross-lateral movements (opposite arm and legs), side-bending, extension in reaching up, and so much more. Plus, it’s fun! 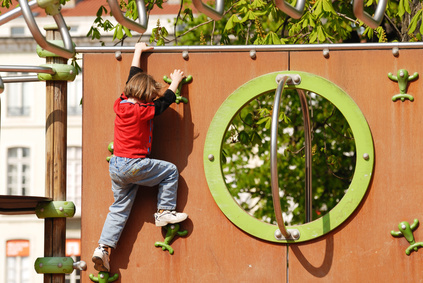 Many of today’s parks offer a variety of climbing structures — everything form rope ladders to climbing walls. With a variety of climbing structures, comes a vast array of climbing options. Yippie! See each climber encourages or requires a child to engage in specific types of climbing behavior. These can include use of both hands and feet, use of feet and lower body, use of hands and upper body, use of equipment in multiple ways, and balancing the body on moving equipment. The slope of equipment, types of handholds, distance between components and various other features contribute to these different patterns of use. All of this is good news — because when we are trying to shift a habit, adding in variation (with fun) is important. Stephen Rosenholtz’s Move Like the Animals & Monkey Moves DVD Set is a fantastic and fun resource for all kids. I highly recommend ordering a copy. You can also use your imagination and inspire your child to explore the moving like the animals below. You can even make a mask for each animal and enjoy the wonders of Arts and Crafts. RIBBIT! Knees bent, arms straight is exactly what the STNR is. So if you got it, flaunt it. Squatting down with her arms on the inside of her legs like a little leaping frog will help to open those hips while honoring the wisdom of the reflex. So clear some space, jump around, and remember that RIBBIT is the sound. Here is a playful opportunity to revisit the creeping phase. Lie on your tummy and lean on your elbows and forearms. (Now it’s time for your singing voice) You bend your leg to the side and look around…..sssssss that’s the sound. Now slide it back down. Bring the other knee up and look around…..sssss that’s the sound. Now slide it back down. See if you slither and slide all the way across the room and back. One of the way that infants utilize the STNR reflex and begin to integrate it is by rocking on the hands and knees. This weight shifting helps balance the muscular systems of the upper and lower halves of the body and play a role in improving the visual accommodation. You can encourage this by playing the Pouncing Tiger. The two of you can get down on all fours and ROAR as loud as you can as you shift your weight from knees to your hands. Roar and rock. And rock and roar. Just think about all the things a little kitty-kat does. Meow-meow your way onto your side, then curl up into a ball and try to hide. Roll to-and-fro from side-to-side. Then rest on your back and stretch your hide…reach, reach your paws in all directions. Then meow and roll, meow and roll. Then up on all fours to roam around we go. Shhhhh….what’s that you hear? Round your back and show your fear. Oh and now to your delight, there’s a small ball in your site. So hunt it down, and bat it around with front paw left and front paw right. Ahhh…and now it’s time to curl up again and say good night. Please seek a movement specialist if you don’t see changes, feel that your child is past the point of playful home-intervention, or feel unsure. I would recommend finding a practitioner that will work with your child as a whole, taking into account both the physical body and the innate capacity for learning. Have a practitioner or method you love? Leave it in the comments area for others to see. I appreciate thoughtful critique and criticism. I also welcome a chance to learn from your knowledge and experience, even if it counters my own. However, if your comment contains name calling or blatant insults then it won’t be published. If you simply argue that W-Sitting is wrong and harmful AND it is obvious that you didn’t read the whole post, your comment won’t be published. Disagree with something I have written? Then please, put on your critical thinking cap & pick up your articulate writing pen and share your brilliance. Your thoughtful comments will be shared as long as you keep it clean and cordial.